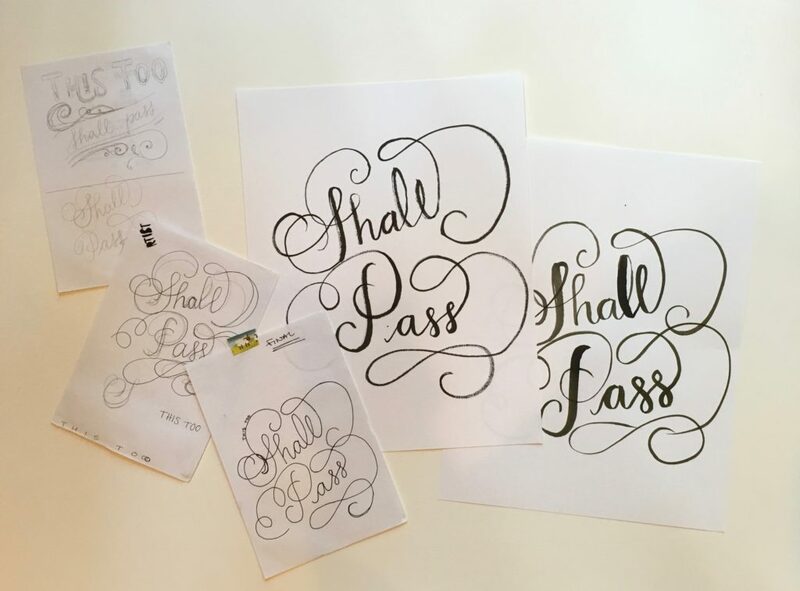 This too shall pass. 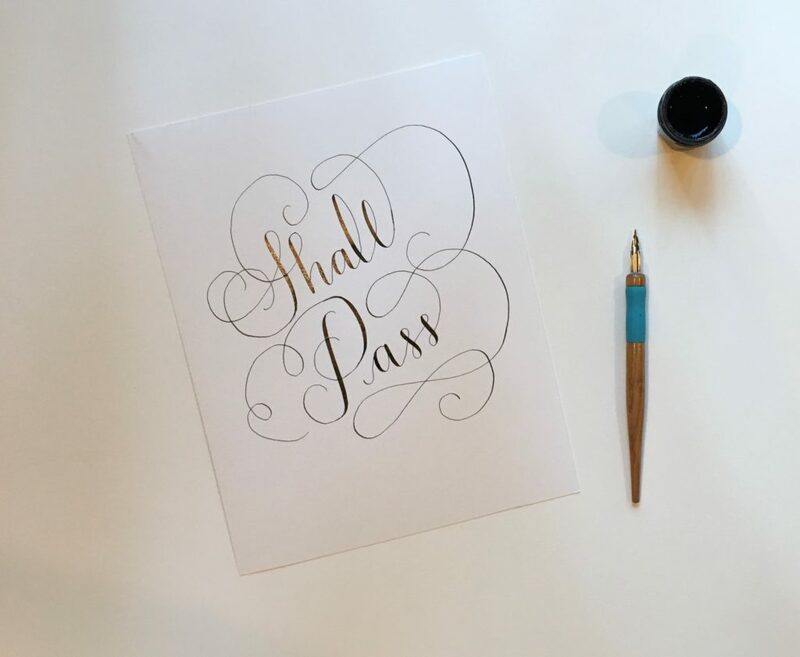 It may pass like a kidney stone, but it will pass. 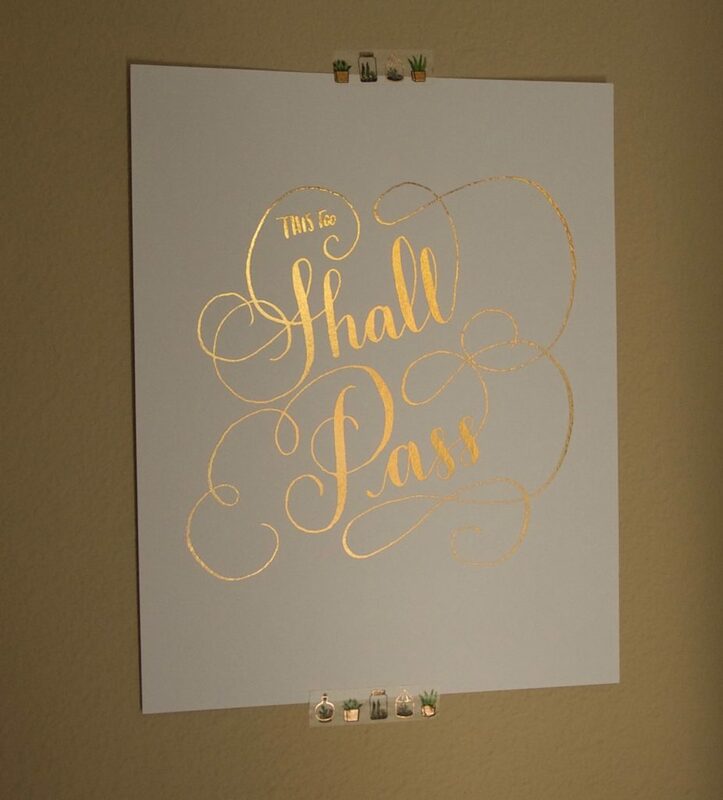 A few weeks ago, I introduced you to my This Too Shall Pass gold foil print. Now, I want to tell you a little bit of the story about how I created this piece and my creative process. 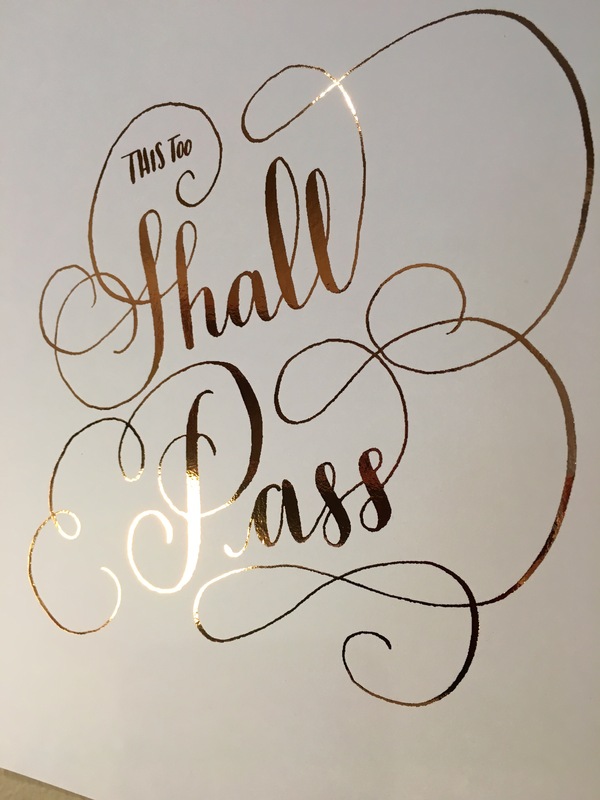 Ever since I heard the popular story about a king asking the wise men for some advice to have in mind for bad times and the “This too shall pass” phrase as that piece of wisdom to remember in bad but also in good times, it kind of always stayed with me. This popular saying has helped navigate some difficult moments in my life, to put things in perspective; but it has also helped me to be more aware of my present and really try to enjoy it what I’m living at the moment I’m living it. That’s pretty much why I decided that I wanted to have this saying hanging on one of the walls of my studio, a beautiful reminder for my life. So I started this project with my sakura pencil on my sketchbook. And from then on, I started doodling different ideas. After I got one concept that I liked, I decided it was time to start the inking process. But I wasn’t sure on the medium, so I tried pretty much all I had! I tried with microns, with a water-brush, watercolor brush, brush markers, Pentel brush marker… But I still didn’t like the results. So I went back to my first love in Modern Calligraphy: my favorite “beginner” nib, a Nikko G, and my Tachikawa n40 straight pen holder. And finally, I was happy with a result! I still had to clean it a little but I had something I liked a lot, with a beautiful dance of thin and thick lines! 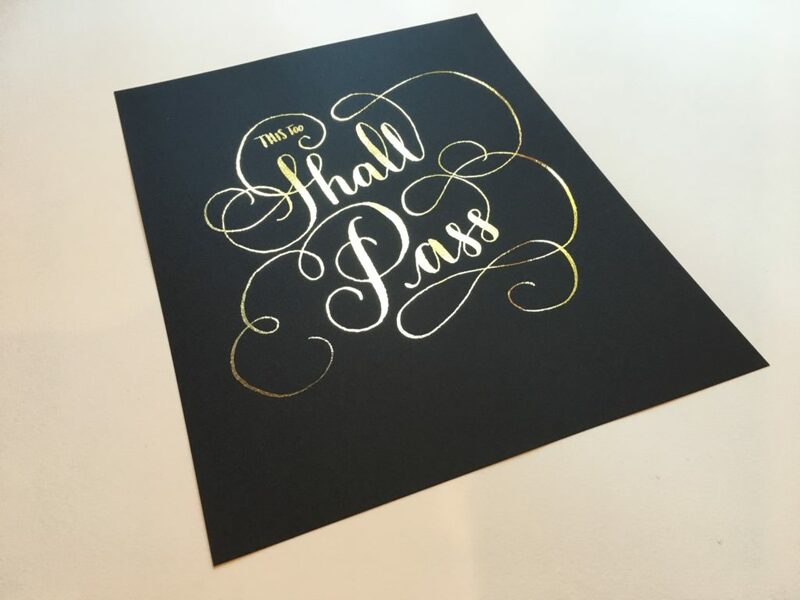 But I thought that I still could make this piece even prettier… That’s when the idea of making it a foil print appeared on my mind and this is the result! I’ve made this print available for sale on my etsy shop, so you can now order your favorite version (black or white paper) clicking here. It will take 3-4 days to process your order and then it will be ready for shipping and more news… now also I can ship this print internationally! 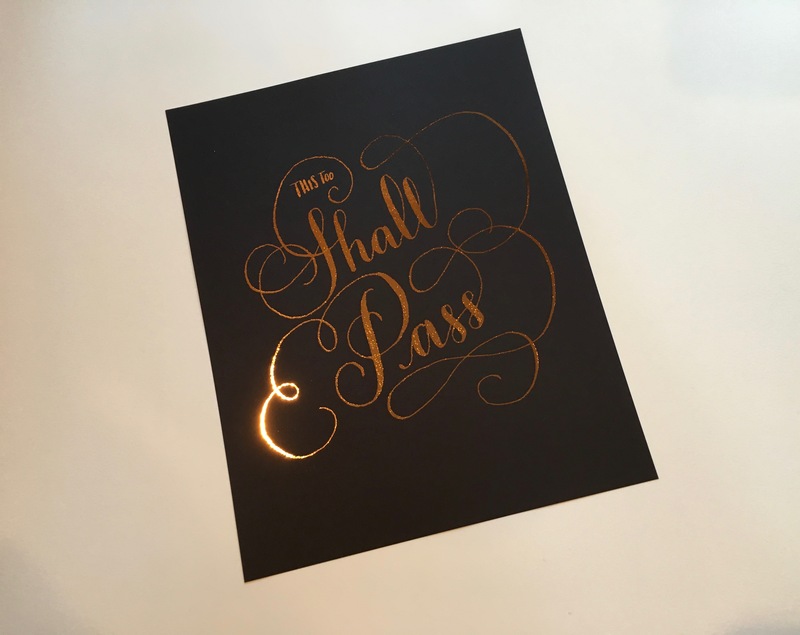 Ok folks, as always, thanks for reading and let me know in the comments what you think about this foil print! I’d love to know!